The Triumph TR250 is the Americanized version of the European TR5 PI. Both were updates of the TR4A, which added a complicated independent rear suspension option to the original TR4. The TR250 bodywork remained the same, with only minor differences to the grille. While the TR5 PI had Lucas fuel injection fitted to the new 2.5-liter six-cylinder engine, derived from the Triumph 2000 sedan, the TR250 carried lean-running twin Zenith-Stromberg carburetors, in order to pass U.S. emissions regulations. 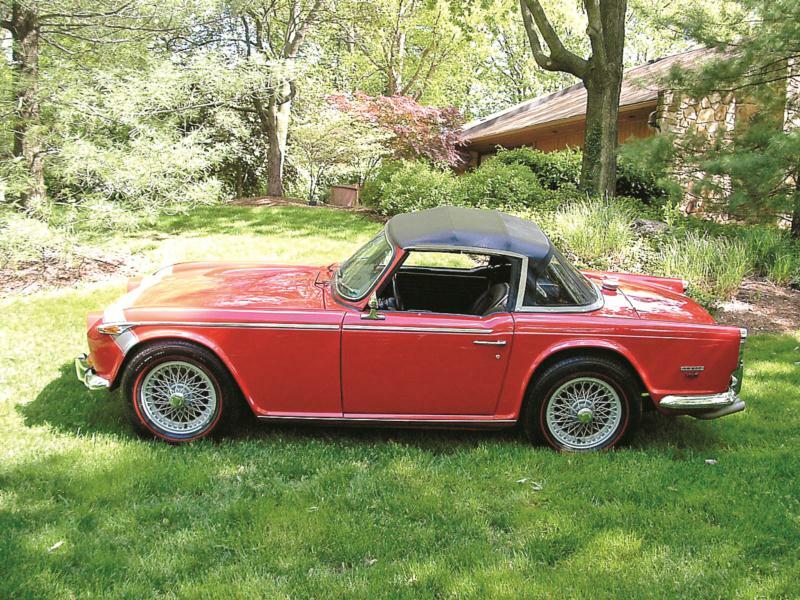 The result was 111 hp instead of the TR5’s 150 hp, and performance is commensurately reduced; 0-60 mph in a leisurely 10.6 seconds, 18.8 seconds for a quarter mile and a top speed of only 107 mph. By contrast, the fuel-injected TR5 could do 0-60 mph in 8.1 seconds, a quarter mile in 16.5 seconds and had a top speed of 120 mph. Inside, the TR250’s safety padding slightly reduced the interior space and the switches became rockers instead of toggles. Car and Driver was quite disappointed with the performance of the TR250, particularly that the butterflies on the carburetors were very slow to close. The result was that “the engine loses revs very slowly, like a John Deere Tractor, with a 100-pound flywheel,” the magazine complained. Many TR250s were converted to Weber carburetor setups and with a more aggressive camshaft are the equal of their finicky fuel-injected TR5 siblings. The TR250 often wore reflective racing stripes, faux mag wheels or knock-off wires. The top featured reflective stripes to the sides for additional visibility at night, and some cars were sold with Surrey tops, with a removable center panel and fixed rear window. The car had a four-speed transmission with optional overdrive and a lower rear axle ratio to take advantage of the six-cylinder engine’s torque. Suspension was independent coil spring all round, with wishbones up front, and trailing arms in the rear. The brakes were Girling discs up front with drum rears. Steering was by rack-and-pinion. Only 8,484 Triumph TR250s were sold, which meant there was room on the production line for more TR5 PIs. Some of the 2,947 built can be found in Canada, or have made their way south. The Lucas fuel injection can be tricky, but is very effective when properly set up. The TR250 and TR5 have the same rust issues as TR4 and TR6 models and should be inspected carefully, especially the floors and rocker panels. The differential mounting plate should be examined for cracks, and the rear suspension bushings checked for wear, as a rebuild is complicated and time-consuming. While strictly an intermediate model, as the TR6 came along in late 1968, the TR250 is quite distinctive with its quickly recognized stripes and can be easily tuned to be a respectable performer.